Worksmith will open a second space in Melbourne’s CBD in April, teaming up with property group GPT to bring its co-working hospitality hub from Collingwood to the city. 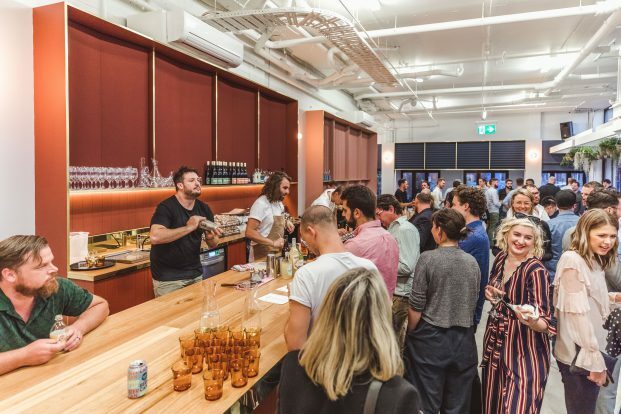 The new space, housed in a new hospitality precinct called ELLA, will also be more drinks-focused than Worksmith in Collingwood – with an on-premise lab for drinks professionals and liquor companies to experiment and prepare for events. High-tech features include centrifuges, water baths and dehydrators – all fully contained and soundproof to respect other guests. The original Worksmith – the brainchild of Michael Bascetta (Bar Liberty, Capitano, Grow Assembly) and property developer Roscoe Power – opened early last year. According to the team, a Sydney expansion is also on the cards for 2019. Worksmith’s roster of regular events will continue across both locations, though Worksmith ELLA will taper towards more drinks-focused content for both members and non-members. The ELLA address will also house a new layout with the addition of four semi-enclosed private offices as well as a casual area with couches, bar, media room, and communal desks catering for up to 70. Located on level one of the development, the new location will also feature an adjoining retail space for Worksmith events and pop-ups, offering a highly-visible means to connect with city workers and commuters. Described by Bascetta as “Australiana meets desert”, Worksmith ELLA’s fit-out has been designed by award-winning architect Chris James, who also designed Worksmith Collingwood as well as Capitano and Above Board.